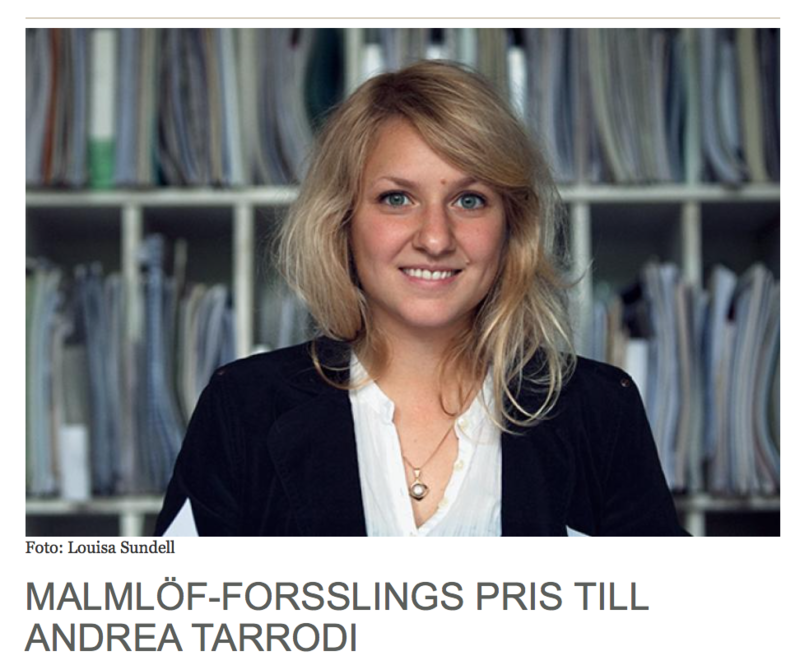 During 2011-2013 Andrea Tarrodi is Sveriges Radio P2:s Composer in Residence. The residence includes, among other projects, commissions from the Swedish Radio Symphony Orchestra and the Swedish Radio Choir. Andrea Tarrodi is the Västerås Sinfonietta´s Composer in Residence during 2013-2014. A residence that, among other projects, includes the world premiere of Tarrodi´s new cello concerto with Jakob Korányi as a soloist and a new piece for serenade ensemble. All Tarrodi´s pieces performed by Västerås Sinfonietta during 2013/14 will be recorded and released on CD by dB Productions. "Den svenska tonsättaren Andrea Tarrodi är en stigande stjärna och den nya skivan visar varför." 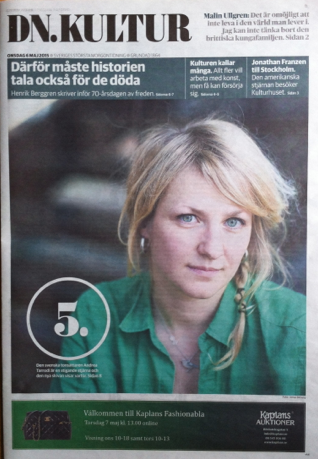 Andrea Tarrodis Paradisfåglar for string orchestra at the Baltic Sea Festival at Musikaliska, Stockholm on September 3rd at 3.00 pm. 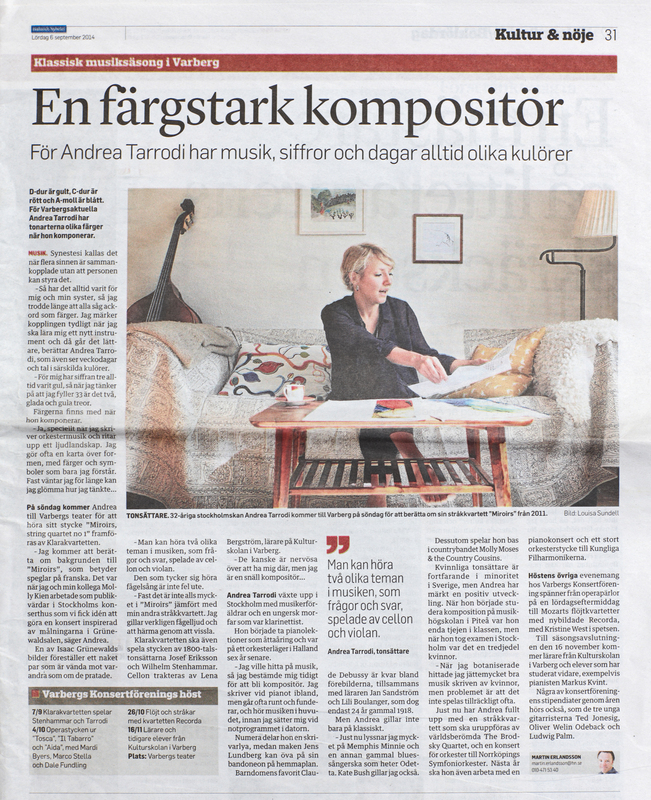 Andrea Tarrodi receives the Carin Malmlöf-Forssling Composer´s award from The Royal Swedish Academy of Music. Motivering: "Inspirationen från naturen – både dess regelbundenhet och dess nyckfullhet, är påtaglig i Andrea Tarrodis musik. Flyhänt, lyhört och med stor varsamhet komponerar hon fram sin egen inre ton där klang, formspråk och kolorit bildar en dynamisk helhet." World Premiere: Songs of the Sky - Concertino for piano and strings commissioned by and dedicated to Natalya Pasichnyk premiered in the Ukraine in November 2016. The piece is financed by STIM. 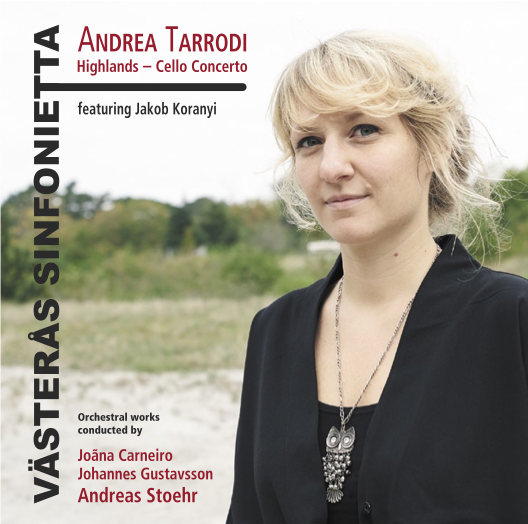 On March 20, 2014, Tarrodi´s Highlands - Concerto for violoncello and orchestra is premiered by cellist Jakob Korányi and the Västerås Sinfonietta, conducted by Joana Carneiro. The concerto is a commission from Västmanlandsmusiken and has it´s world premiere at the Västerås Concert Hall. The piece will also be released on record. 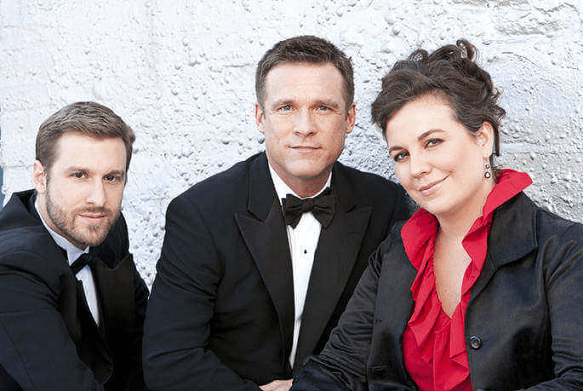 On May 7, 2015, Tarrodis Sorg och Glädje, with lyrics by Runeberg, for tenor and violoncello is premiered by Scott Murphree, tenor, and Mimi Brundin Sunnerstam, cello at the Swedish Church in Paris. The piece was commissioned by the American Mirror Visions Ensemble as part of their concert programme "Sounds of Swedish Poetry". The piece is also be performed on May 10 at the American Church in Paris. On April 12, 2015 the Brodsky Quartet premiere Tarrodis 3rd string quartet Light Scattering. The piece is a commission from Musik i Syd. 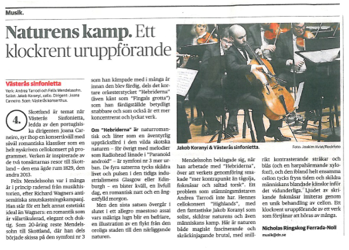 The Brodsky Quartet then go on tour in with the piece and give several concerts around Sweden during spring 2015. 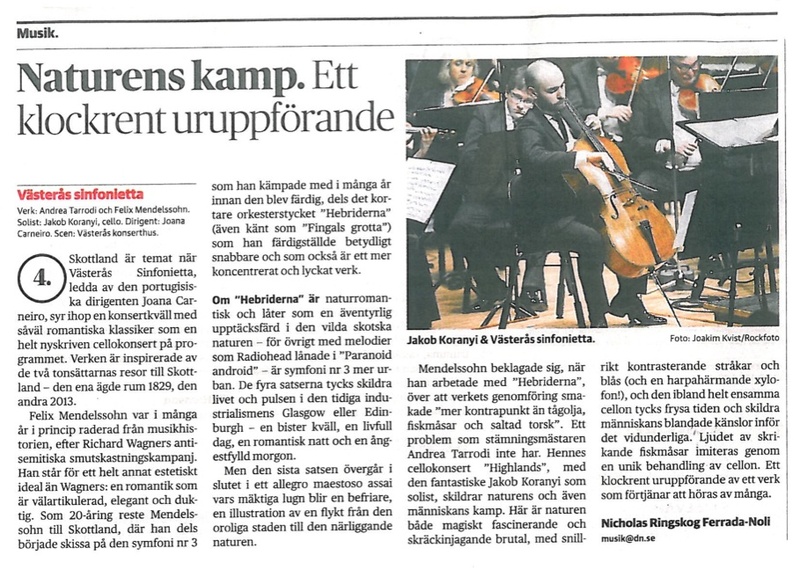 Tarrodi´s Lucioles for orchestra is performed at the opening concert of the Vinterfest Festival on February 6, 2015 in Mora Kyrka, Dalarna. The piece is performed by Dalasinfoniettan, conducted by Tobias Ringborg. On March 23, 2015 Tarrodi´s Lucioles for orchestra is performed in Leverkusen, Germany by the Helsingborg Symphony Orchestra, conducted by their chief conductor Stefan Solyom. The piece is also performed in by them in Helsinborg, Sweden on March 19. Andrea Tarrodi´s Camelopardalis for orchestra is performed on March 21, 2015. The piece is performed at Kristinehallen, Falun, conducted by Finnish conductor Anna-Maria Helsing. 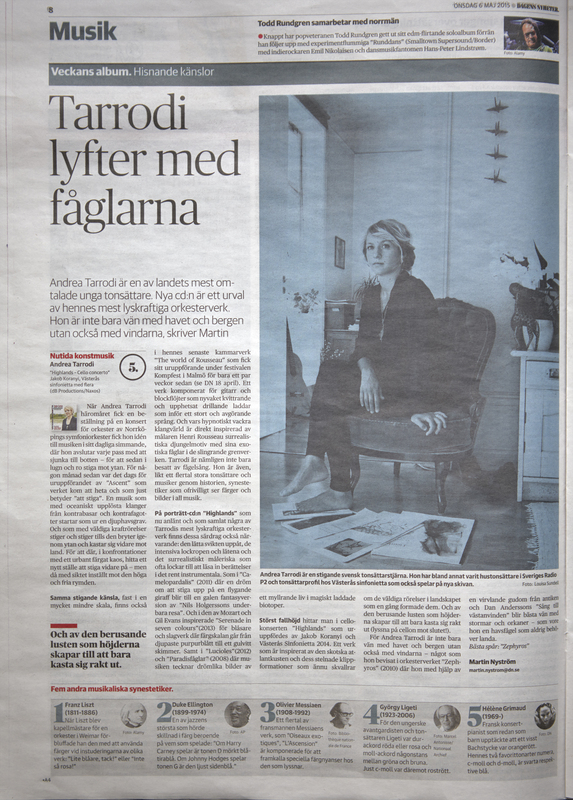 "Andrea Tarrodi har verkligen etablerat sig som kompositör och får uppdrag både från när och fjärran. Camelopardalis eller giraffen är en stjärnbild som man kan se på den norra delen av stjärnhimlen. 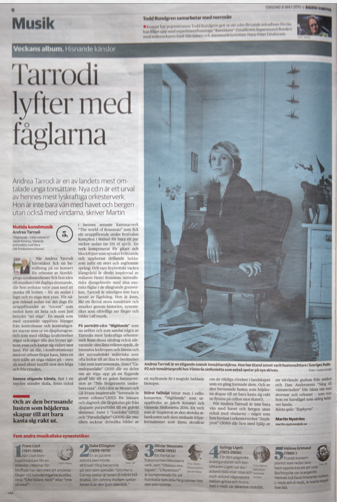 Andrea Tarrodi har i sitt komponerande av verket utgått från en egen dröm om en giraff som tittade in genom hennes fönster, hon hoppade upp på giraffen och red genom fantasifulla landskap. Musiken är verkligen drömlik. De minimalistiska fragmenten sätts samman till större sjok, dynamiken stegras och klangfärgerna intensifieras och exploderar när slagverkets tam tar över. Därefter sjunger giraffen gestaltad av fagottens långa mjuka toner. Effekter i stråkinstrumenten där flageoletter kombineras med glissando och sordinerade trumpeter i kombination med tremolo ger naturliknande ljud. The Dahlkvist Quartet perform Tarrodi´s Madardál - String Quartet No 2 twice in January. On January 16 at the Glafsfjord Music Festival in Ingesund and on January 31 at Ateljé 42 in Stjärnhov. The European Concert Hall Organisation has commissioned 12 choral pieces written by 12 emerging composers based and working across Europe exploring the subject of peace and conflict – past, present and future - both in Europe and beyond. Andrea Tarrodi has been selected by the Stockholm Concert Hall to represent Sweden and will contribute with a piece for advanced children´s choir with the lyrics Dona Nobis Pacem. The piece will have it´s world premiere on November 9, 2014, in both Paris, Lisbon and Gateshead. The work is published by Faber Music. The choir Allmänna Sången performs Tarrodi´s Lume for mixed choir in Moscow on September 28 at the Evangelical-Lutheran Stt. Peter-and-Paul's Cathedral and on September 29 at the Moscow Tchaikovsky Concervatory. The choir is conducted by their chief conductor Maria Goundorina. In 2013 The Vadstena Academy was given the Guldkvasten Award which includes the funds to commission a piece. 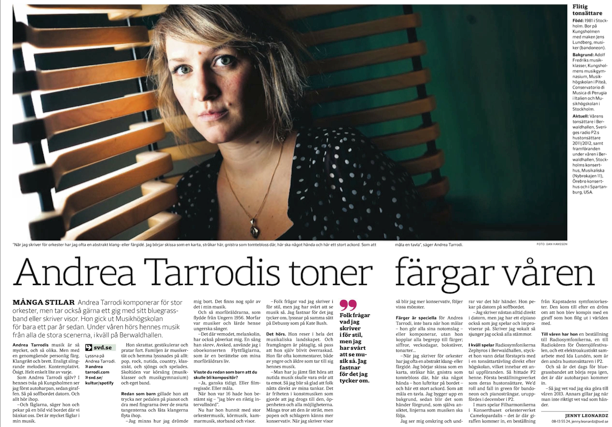 The Vadstena Academy has chosen to commission a new piece by Tarrodi, for soprano, mezzosoprano and orchestra. The piece, called Aprilserenad (Serenade in April), based on one of Christina, Queen of Sweden´s aphorisms, will be premiered in Vadstena on Juli 31. Scenkonst Sörmland has commissioned a new piece for soprano and chamber orchestra by Tarrodi. The piece will be premiered by Katarina Dalayman and Scenkonst Sörmland Sinfonietta on September 4, in connection to the opening of Scentkonst Sörmland´s new concert hall. On September 18 the piece will have it´s official premiere, and will also go on tour in October 2014. On July 12 Tarrodi´s Suite for Piano will be performed at the Fuchu Art Theatre in Japan. The piece will be performed by Noriko Kitada during the 4th Nordic Sounds Summer Music Festival in Fuchu, Tokyo. In connection to the 20 year jubilee of Gustaf Sjökvist´s Chamber Choir the choir has commissioned new compositions by among other Tarrodi, S-D Sandström and Paula af Malmborg. 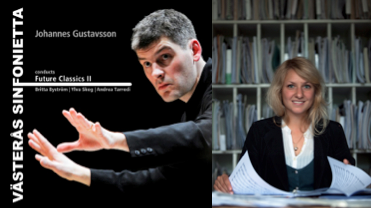 Tarrodi´s piece "Ekarna" is premiered at the Eric Ericson Hall on April 5, 2014, conducted by Gustaf Sjökvist. 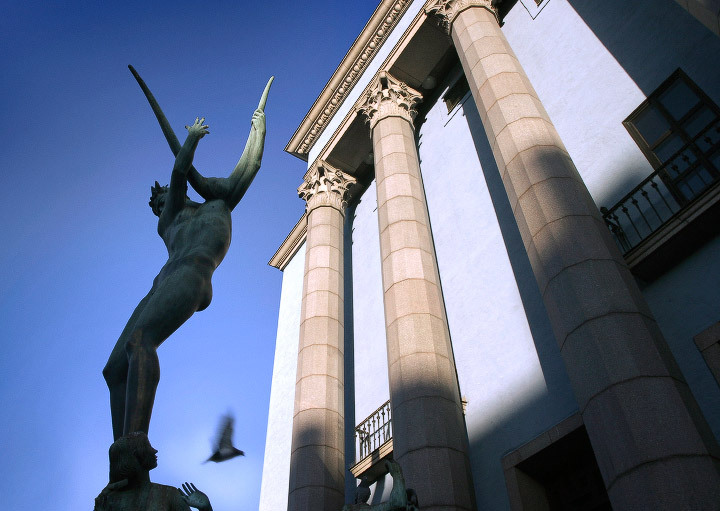 The Royal Stockholm Philharmonic Orchestra performs Tarrodi´s Zephyros for orchestra on January 15 and 16, 2014. The piece is performed at the Stockholm Concert Hall, conducted by Daniel Blendulf. 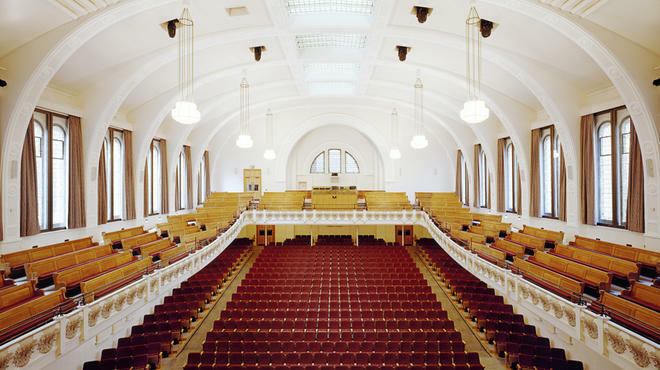 On May 17, 2014, Tarrodi´s Lucioles for orchestra is performed at the Cadogan Hall in London, England. The piece is conducted by Christian Lindberg and performed by the Västerås Sinfonietta. Pianist Peter Friis-Johansson premieres Tarrodi´s Crystallites on September 22 at Kulturhuset i Ytterjärna. The piece is commissioned by Sveriges Radio P2 and the concert is also recorded by SRP2. Friis-Johansson also performs the piece on November 27 and 28 at the Berwald Concert Hall. Marc Soustrot conducts Tarrodi´s Liguria with the University of Gothenburg Symphony Orchestra on October 18, 2013. The piece is performed at the Gothenburg Concert Hall. On November 21, 2013, Tarrodi´s Serenade in Seven Colours is premiered at the Västerås Concert Hall by the Västerås Sinfonietta´s winds and percussion. The piece is a commission from Västmanlandsmusiken. Tarrodi´s Crystallites for solo piano and Evening Songs for tenor and piano are performed on November 22nd in New York at the Church of St. Matthew and St. Timothy on a program called "Nordic Currents". The performers are Michael Slattery, tenor and Thomas Bagwell, piano. In September 2013 Finnish Yl Male Voice Choir perform Tarrodi´s Laulava Meri in Lahti, Rauma and Hämeenlinna. Conductor: Pasi Hyökki. In October, 2013, the Swedish male voice choir Orphei Drängar take the piece on tour and perform it in Uppsala, Västerås, Linköping and Stockholm. Conductor: Cecilia Rydinger Alin. On September 12, 2013, Tarrodi´s Birds of Paradise 2 for orchestra is premiered by the Västerås Sinfonietta conducted by Andreas Stoehr. 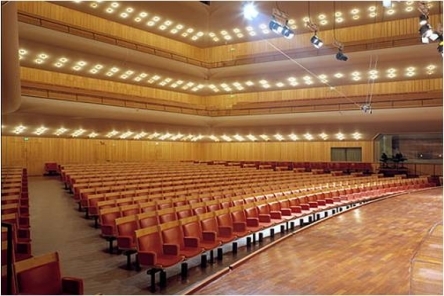 The concert is held at the Västerås Concert Hall. The piece is commissioned by Västmanlandsmusiken. 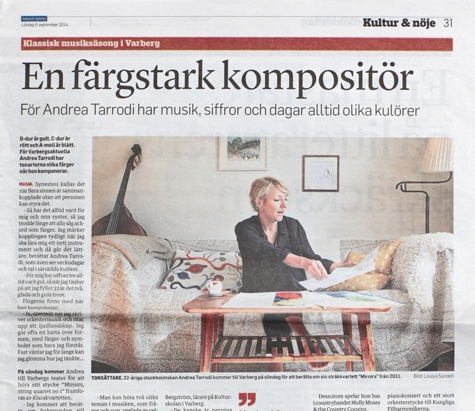 In conjuction with Swedish Duo FriBerg´s 10 year jubilee the duo has commissioned a piece by Andrea Tarrodi. The piece, "Szél", is premiered on September 26, 2013, at Utvandrarnas Hus in Växjö. The concert is broadcasted live on Sveriges Radio P2. Duo FriBerg also performs the piece in November 2013. The Phoenix Concerts presents a concert with Scandinavian composers in New York, USA. On the 12th of April Tarrodi´s Akacia for piano trio is performed by Rachel Lee, violin, Sophie Shao, cello and Thomas Bagwell, piano at the Church of St. Matthew & St. Timothy. On May 30 the Helsingborg Symphony Orchestra performs Tarrodi´s Camelopardalis, conducted by Thord Svedlund. 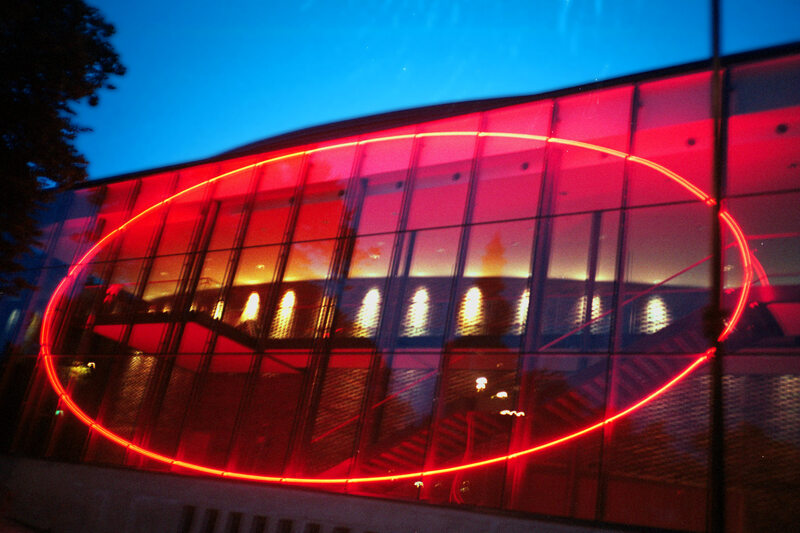 The piece is performed at the Helsingborg Concert Hall. 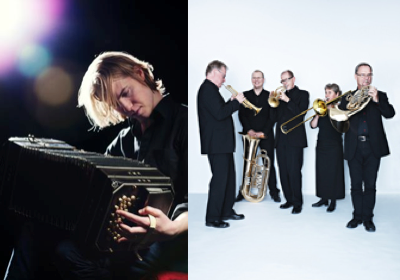 On April 6, 2013 Tarrodi´s El Hielo for bandoneon and brass quintet is premiered by Jens Lundberg, bandoneon, and the Linné Quintet at the Uppsala Concert Hall. The piece was a commission from MIU (Musik i Uppland). After the premiere in Uppsala the piece will go on tour around Uppland with the ensemble. The YL Male Voice Choir has commissioned a new piece by Tarrodi. The piece Laulava Meri (Singing Sea) is premiered by the choir at the Helsinki Music Centre in Helsinki, Finland on April 6, 2013. Conductor: Pasi Hyökki. The Eric Ericson Chamber Choir performs Tarrodi´s Lume at Nacka Kyrka on February 19th and at the Grünewald Hall in Stockholm on February 20th, 2013. The piece is conducted by the choir´s new music director Fredrik Malmberg. 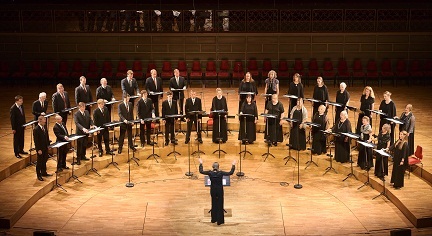 The choir also performs the piece at the Festival van Vlaanderen Mechelen, Belgium in May 2013. Tarrodi´s Lucioles for orchestra performed in the U.S.
On January 19, 2013, the Spartanburg Philharmonic performs Tarrodi´s Lucioles for orchestra for the first time in the U.S. The piece has it´s U.S premiere at the Twitchell Auditorium in Spartanburg, conducted by Sarah Ioannides. "... Lucioles shimmered and fluttered, creating a glowing soundscape that was at once serene and lively ..."
Finland premiere: On November 8, 2012, the Joensuu City Orchestra performs Tarrodi´s Zephyros at the Carelia-sali, Jouensuu, Finland. The piece is conducted by Ville Matvejeff. On September 19, 2012, Tarrodi´s Lucioles for orchestra is performed by Sinfonia Finlandia at the City Theatre in Jyväskylä, Finland. Conductor: Patrick Gallois. Choreography and Dance: Virpi Pahkinen and Oskar Landström. During the Signal Brass Festival in Gävle Tarrodi´s Fragments of the Royal Fireworks is premiered on September 11, 2012, at Lilla Gasklockan. The piece is also performed in Germany on December 12. On September 15, 2012, Tarrodi´s Serenade to an Old Man is premiered at the Gävle Concert Hall. Both pieces are premiered by the Stockholm Chamber Brass. The Swedish Radio Symphony Orchestra performs Tarrodi´s Lucioles for orchestra and Flyttfåglar for oboe and strings with soloist Emmanuel Laville at Berwaldhallen on May 31, 2012. Solar Flares by Katarina Leyman and Breaking the Ice by Karin Rehnkqvist is also performed. Conductor: Michael Bartosch. On April 20 the Swedish Radio Symphony premiers Tarrodi´s new piece Liguria for orchestra at the Berwald Concert Hall. 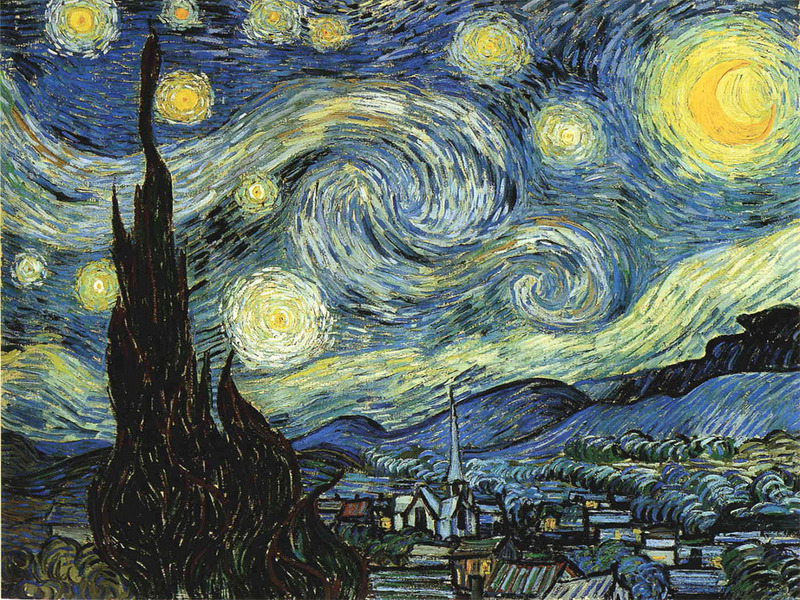 The piece is a commission from the Swedish Radio and is also performed on April 21, 2012. Conductor: Daniel Harding. Daniel Harding conducts Andrea Tarrodi´s Zephyros for orchestra with the Swedish Radio Symphony Orchestra. The piece is performed at Berwaldhallen on February 17 and 19, 2012. 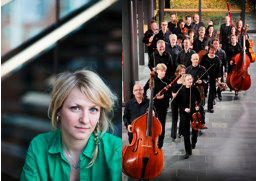 The Swedish Chamber Orchestra has commissioned an orchestra piece by Andrea Tarrodi. The piece, Lucioles, is premiered by the orchestra, conducted by Christian Lindberg, on March 29, 2012, at the Örebro Concert Hall, Sweden. 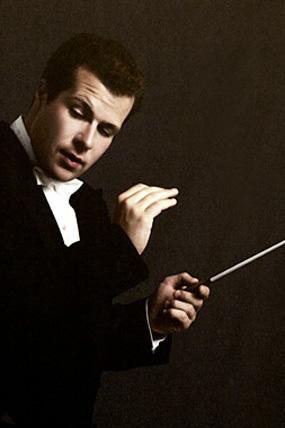 On March 31, 2012, the Spartanburg Philharmonic performs Tarrodi´s Zephyros. Spartanburg Philharmonic´s chief conductor Sarah Ioannides conducts the piece at the Twichell Auditorium, Spartanburg SC, USA. Andrea Tarrodi´s Camelopardalis for orchestra is performed by the Royal Stockholm Philharmonic Orchestra at the Stockholm Concert House on March 7 and 8, 2012. Conductor: Niklas Willén. The Swedish Horn Society and Sveriges Orkesterförbund have commissioned a concerto for two horns and wind orchestra. The piece is premiered by Arméns Musikkår on March 4, 2012, at Musikaliska with soloists Annamia Larsson and Markus Maskuniitty. Conductor: Mats Janhagen. On January 26 and 27, 2012, the Swedish Radio Symphony Orchestra performs Tarrodi´s Camelopardalis at Berwaldhallen. The piece is conducted by Susanna Mälkki. The Stockholm Concert Hall has commissioned six compositions written for members of the Royal Stockholm Philharmonics by Andrea Tarrodi and composer Molly Kien. The compositions, inspired by Isaac Grünewald´s art works, are presented at a concert at the Grünewald Hall in the Stockholm Concert Hall on October 16, 2011. The concert is also broadcasted on Sveriges Radio P2, December 7. On October 15 Hugo Ticciati, violin and Michael Tsalka, piano perform Andrea Tarrodi´s Nocturne over B, A, C & H at the Cervantino Festival in Mexico. The duo also perform the piece in China in November. Andrea Tarrodi´s Zephyros for orchestra is performed twice during spring 2011. The Swedish Chamber Orchestra performs Zephyros conducted by Brett Dean on March 31, 2011, at the Örebro Concert Hall. On April 14, 2011, Shi Yeon Sung conducts the piece with Gävle Symphony Orchestra at the Gävle Concert House. Thirty-one pieces for chamber orchestra were submitted to Uppsala Tonsättartävling (the Uppsala Composition Competition). Andrea Tarrodi was one of the six finalists and competed with her piece Zephyros, which was premiered by the Uppsala Chamber Orchestra at the Uppsala Concert Hall on March 4, 2010. The piece tied for first place in the competition with The only thing that you keep changing is your name by Jonas Valfridsson. As part of the prize Zephyros will be performed by several Swedish orchestras during 2010, -11 and -12. Så här lyder juryns motivering till vinnaren Andrea Tarrodi; "Stor formsäkerhet parat med klangskönhet och en känsla av självklar naturlighet i handlaget med orkestern"